I think its a mixed bag but mostly terrific! YOM, Masquerade, Our Day Will Come are among their best. Even "Sing" is kind of sweet, bittersweet, in hindsight. The Oldies Medley is well done and fun- but now some seems dated. Still a wonderful disc! The overdubs on the oldies medley more than makeup for the DJ schtick. I actually prefer the production to CarpenterS Bacharach/David medley. I'm so good at doing these backup vocals that often can't tell who is singing what. Of course Yesterday Once More was a smash and I thrilled to its abundant airplay. If I could meld or remix the original recording with RC's remix the outcome would prove supreme for me. I love the re-recorded piano parts in the remix and the overdubs of the initial works. The Reader's Digest set also has a unique approach to the oldies medley. The removal on Tony Peluso most notably. The general course of oldies taken as a whole are featured sequentially. Finally, I have always felt that I Can't Make Music is one of Karen's finest turns here. Free of classic harmonies, just raw Karen. There is an emotional display and intensity of delivery that makes for a stand-out track. While churning out the hits I feel that Can't make Music and/or This Masquerade would've been more viable singles than SING la la la la la. SING seemed to take the duo deep into the MOR, elevator and children's sound that didn't further their image or expand their listening public. While SING has its moments I must again refer to the screaming mee-mees doing back-up that make the hair stand up on the back of my neck. Ironically this is the concert tune Karen had me chime in on February of '78 at Harrah's Tahoe. Yes I was the mee-mee doing la las. Whatcha gonna do? She didn't invite me to sing anything else. GaryAlan and A&M Retro like this. I love this album. This was my fourth Carpenters album. (Horizon, Singles, and a Song For You came first) Found it at a yard sale for 75 cents and about wore it out as a kid. I Can't Make Music is one of Karen's most stunning vocals and Richard's piano solo on Heather is excellent. Even the voiceovers on the medley are fine with me. Horizon is still my all time fave but this captures such a diversity of material that it ties for second with A Song For You IMO. 70sFan and toeknee4bz like this. For me it's only half an album. Love side one and Yesterday Once More on side 2, but wished for CARPENTERS songs on side 2. I saw Carpenters 'live' just two weeks prior to 'Now and Then' being released, so this album brings back many special memories. Being only 11 when I saw them 'live', I didn't really know the oldies (other than 'Fun, Fun, Fun') at the time. My older brother and sister knew all of the oldies at the concert, and they were going crazy in their seats. I still remember Karen's hair blowing all over the place when she was drumming. Anyway, seeing the album in stores with those oldies titles made me realize they had performed several of them at the concert. So I couldn't wait to hear it. 'Now and Then' was the perfect album for summer, and it came out just as school was ending for the year. I remember the album being 'previewed' on a local Kansas City radio station. They played 'Yesterday Once More' through 'Da Doo Ron Ron' without interruption, which was rather unusual for an AM station to do at the time. I caught the last half of it on tape, and remember it was the 'Album of the Week'. A couple of days later, my brother surprised me with the album as an early birthday present, and I freaked. It was propped up on my parents' console in the living room. Stopped me dead in my tracks. Great gift for a kid who didn't have the jack to buy it. I distinctly remember bringing my record player out on the front porch (I was 11), and all the kids in the neighborhood going nuts on that June summer night digging on the oldies medley. I think we played it 3 or 4 times. Karen's vocals are stunning throughout. All one has to do is listen to this album in full to hear exactly what she was capable of doing. Everything from the lead vocals to the intricate background vocals in the oldies medley to the awesome drumming. Top notch. Richard's arrangements, great vocals and creative ideas were also in abundance on this record. All of these efforts are REALLY brought to the fore when you hear it in quadraphonic. 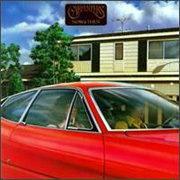 Far and away the best 'quad' mix released by Carpenters. It took me 28 years to hear that mix, but the wait was worth it. goodjeans, GaryAlan, 70sFan and 1 other person like this. Well first off, it was the duo's photo on the cover of this album that I first associated with K and R. My Mum had Now and Then on cassette in 1990, and it was often lying around. I didn't hear the music from this album, but from the recently released Only Yesterday compilation. I like the cover, but it is a strange reproduction of the duo. Both look rather dour, and Karen's head is bisected by the car window frame. Strangely though, this image of them always seemed to fit the music. . .colour bleached. . . quintessentially (to me) 1970's. . .nostalgic. . .weirdly off-kilter suburban. . .serious. A much more accurate representation of the pair than the shiny happy profile shot that was on the sleeve of the album (but that wasn't included on my Mum's bargain basement cassette). Anyway, to the music. I remain very fond of all the album. . . including the DJ shtick. Having heard the material scores of times Peluso still makes me smile, if not chuckle, which says a hell of a lot about his talent, and about K and R's execution of the script. The only exception is Jambalaya, which I swing back and forth on. Sometimes I find it too clipped and polished, other times I think the sterile treatment works to its favour. After the creative apex (arguably) of their careers with ASFU, this album feels like the very beginnings of a come-down, but with such brilliant ideas in Richard, the collection is still stunning. I also feel that Karen's voice never sounded better than on this album (with Horizon and Christmas Portrait vying with it for the top spot). Final comment. I honestly feel no song was more suited to K and R's skills both individually and collectively than This Masquerade. It is stunning. . .timeless. . .sophisticated. Lilting, haunting, "soft" in the best sense of the word, jazz. This song could be called Lounge. . .but if it is. . .it's the most special, wonderful lounge on earth. . .with free drinks and sofas that sink into forever. no1kandrfan and A&M Retro like this. I like this album but it's one I haven't listened to in full in many years. "Sing" hasn't worn well for me -- I liked it when it came out but I hardly ever play it these days. I agree with the above poster that it probably hurt their career. Especially considering that Richard was already ticked off about their "cutesy" image at the time, the fact that they even recorded that song, let alone made it a single and the leadoff track from their album is kind of surprising! I've always enjoyed the oldies medley and "Yesterday once More" is arguably my favorite Carpenters single, along with "Close To You." It's pure pop perfection. If you are a fan of the oldies, there's really not a bad track on the album, when you get right down to it. NOW & THEN, like its title, always has me thinking in two ways. I recall how excited I was at its release. If I'm not mistaken, the album came out right around the time that Carpenters were touring in support of it. They visited Valley Forge Music Fair, and some friends and I went to see them. I remember Richard talking about the oldies medley and how the version on the album was "a little softer for the home system" and having heard the album a couple of times at that point, I knew what he was talking about. "Sing" has worn thin as has the oldies medley itself, though thanks to the Readers Digest set, I can listen to some of the tunes separated out from the medley, with no interference from Tony Peluso's DJ. That leaves the excellent "Yesterday Once More" and a few other songs to pick up the slack. Some do, others don't. I've come to appreciate and like "This Masquerade" much more in later years than I ever did when when the album was new. "Heather" was a familiar tune from commercials and I enjoyed it then, but not so much now. "Jambalaya" I liked a lot having never heard anyone else's version prior to this one, so while a lot of folks hear it as a cover, to me it was fresh. That just leaves "I Can't Make Music", which is another that I used to tolerate, but have come to like a lot more in recent years. So, overall the album kind of falls in the middle of the pack for me. It was fun and adventurous in its day, but it tended to wear thin over the years. I never really cared that much for the cover. I don't think I even noticed it had visible occupants for years, so it kind of left me cold. The house didn't mean anything to me at the time, so I thought it was just a picture of a fast car, kind of a reference to the "Fun, Fun, Fun" sort-of oldie. Yeah, this album's a mixed bag for me, too. "Sing" has got to be my least favorite of all their singles (the melody's pretty, yes, I can't dispute that, but the song and record as a whole just comes off overly saccharine, and I can't hit the "skip" button fast enough once the kids' choir kicks in), but, on the other hand, "Yesterday Once More" is easily one of the finest singles they ever made and second only to "Only Yesterday" as my favorite of all John and Richard's originals. The problem with "Yesterday Once More," though, is that it's just so darn good that you just can't help but be disappointed by the rest of the record and wish that they'd included some more originals. What did you think of "I Cant Make Music"? I love this album -- from the singles, to the medley to the cool and mysterious tri-fold cover. I think the medley is great and fun; the songs are well picked and their voices/arranging feels perfect, though I do agree that I'd love to hear full versions of some of the covers. The only track that I only not love is "Sing", it's a good ditty but I would like it more if those kids weren't there because Karen is otherwise so joyous - you can almost feel her smile while singing it, especially "...make it simple to last your whole life loooooooong!". This Masquerade and I Can't Make Music are two of their best album cuts. Both so sad, but fresh and enigmatic. That beginning of ICMM with the low note, and cue Karen always gives me goosebumps and I really do picture Karen with a piano in an empty room. And I DO love the harmonica ending - in fact it would be a good flow into Rainy Days and Mondays! Jambalya is very fun and cheery and Heather is gorgeous and gives the album more subtle shadings of darkness. And of course, Yesterday Once More is the biggest gem and deservedly was a hit. It's so nostalgically sad and yet joyous, with one foot in Then and the other in Now. And that haunting, poignant reprise is just a cherry on top. The chosen tracks mirror the nuances of the darker side of the album -- which I feel, has an interesting concept of fun nostalgia (the medley, Sing, Jambalya) contrasted with a dark undertone of maturity, sadness and seeing nostalgia as something that has passed us by (YOM and the rest). The cover's cool mystery mimics these songs and the tracks set up a kind of mood that flows well. The car is driving away from the house behind them with a solemn looking K&R inside. It might be going "too deep", but it's almost a visual representation of the prison-like claustrophobia of suburbia, with the nostalgia and security of it on the other side of the coin. Two different sides, two contradictory mindsets, two moods for the songs. no1kandrfan, goodjeans, toeknee4bz and 3 others like this. I love this album -- from the singles, to the medley to the cool and mysterious tri-fold cover. I think the medley is great and fun; the songs are well picked and their voices/arranging feels perfect, though I do agree that I'd love to hear full versions of some of the covers...And of course, Yesterday Once More is the biggest gem and deservedly was a hit. It's so nostalgically sad and yet joyous, with one foot in Then and the other in Now. And that haunting, poignant reprise is just a cherry on top. The chosen tracks mirror the nuances of the darker side of the album -- which I feel, has an interesting concept of fun nostalgia (the medley, Sing, Jambalya) contrasted with a dark undertone of maturity, sadness and seeing nostalgia as something that has passed us by (YOM and the rest). The cover's cool mystery mimics these songs and the tracks set up a kind of mood that flows well. Well said, RainyDays. And say what you will about Now & Then, but the album is quirky, eclectic, eerie (in places, like “TEOTW,” and the “YOM” reprise), joyful, eccentric, melancholy, mysterious, and a TON of fun (fascinating exploration of the possible symbolism on the AWESOME tri-fold album cover, RainyDays; I’ll be reflecting more on that...). When I moved to Southern California a few years ago, one of my first excursions was the 30 minute drive down the 605 to Downey to be photographed in front of our “Graceland.” Now & Then brought me there). I consider the album one of the most artsy in their canon (except for Offering). The medley side contained some of Karen’s best performances (as the Reader’s Digest Collection vindicated some 25 years later), with my only suggestion being that the siblings might have done well to include hits from the 1950’s, like “The Wayward Wind,” “It’s All In The Game,” “Que Sera, Sera,” “Chances Are,” and “You Send Me,” all which seem to have influenced the duo much more than “Da Do Run-Run” or “Dead Man’s Curve.” Who is with me on this? For the “contemporary” side, the duo wisely selected Leon Russell’s, “This Masquerade,” which was an outstanding album track that should have been the lead-off single, or at least the follow-up to “Sing,” if, for nothing else, credibility purposes. And by the way, I love “Sing.” Love it. But I’m guessing that has more to do with my being 2 or 3 when it was ubiquitous on the radio and it was one of the first Carpenters songs I remember and it is a children’s song, after all, and I was one of those at that time and Vh1 used it (affectionately, I think) on a promo a few years ago and it was from Sesame Street. Sigh...and what the hell? I just love it. The pretty piano instrumental, “Heather,” adds some emotional depth to the proceedings on the first side (I think I missed it as the background of an aspirin commercial), but while absolutely beautiful and a terrific track that I love, for the duo to record a song titled, “I Can’t Make Music,” at that point in their careers, it was just asking for potshots. One other thing (and sorry for all the posts about this album, but I’ve been working on a blog entry for Now & Then, so it’s been on my mind a lot recently). Did anybody else notice that RC seemed to try to correct the “unmusical sound” that pops up the fourth time Karen sings, “When I was young...” on the reprise of “Yesterday Once More” on the Reader’s Digest Collection? You can still hear it, but it sounded a bit more muted in the mix (to my novice ears, anyway). Forgive me if this has already been discussed in another thread, but it was news to my ears, and I absolutely love it! A&M Retro and Must Hear This Album like this. Superb album. Lovely vocals and brilliant arrangements. This Masquerade, Yesterday Once More, I Can't Make Music. End Of The World : all chill-factors for me. That vocal sliding at the finale "..it ended when you said goodbye..." is out of this world. "..their 1973 hit Yesterday Once More has acquired iconic popularity in China, and is played and heard everywhere .."
CraigGA and toeknee4bz like this. This was my very first album - purchased with my grass-cutting money, as a 12 year old lad, and later that same year, once I was 13 - I saw them in concert, November 17th. So - I will always hod a special place in my heart for this album - start to reprised finish. Unlike many, I wasn't in love with Heather. I would have liked another vocal placed there.. But all in all - I loved the record. I remember staring at that cover for hours and hours; Delighting in every detail from the fonts, to the lush Southern California landscaping in front of the house... Cushy head-phones on, and just never wanting it to end... This album, and 1973 in general - was a golden era for K & R, a pretty great year for music in general, (Right Thing To Do, Carly Simon, Daniel, Elton John, Killing me Softly, Touch Me In The Morning, LeRoy Brown, Drift Away, The Morning After, Superstition, You're So Vain, damn.... ) - and I enjoyed every second. Now & Then ranked right up at the top of my personal charts! 70sFan, Jamesj75, A&M Retro and 1 other person like this. ^^^ Agreed. I'm thankful for this extended version. Listen to it often. Kristopher, David A, Charlie D and 2 others like this. cheers for the pic, Gary. P.S. Chris, Now and Then got to No.2 in the UK charts, not No. 19. Karen looks groovey!!! Thanks Gary for the pic. I wonder if all that hair is Karen's? I think she could put a stylist in business....lovely. Today is my Now & Then listening day! to the Jo Stafford (1952) version and/or Sonny& Cher 's version (1970's). apparent that Karen and Richard did a fine arrangement and vocal with the tune.